Deco at CNB, comprised of a 23-story tower and four-story annex building, is located in the heart of the visual and performing arts district and is surrounded by historic landmarks, vibrant street-level retail, museums, galleries and office buildings. 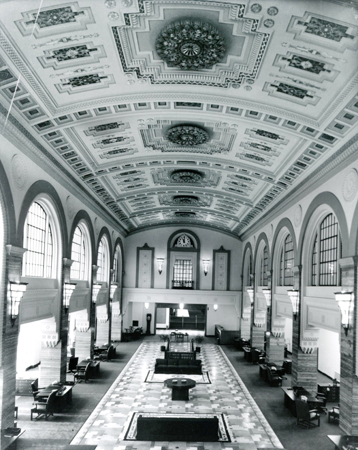 The three-story-high ornate art deco bank lobby with coffered ceiling, patterned terrazzo floors and bronze decorative features have been restored to their former prestige and offer a breath taking experience for all who enter. 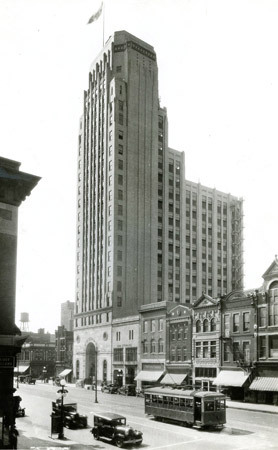 Designed in the late 1920′s by world renowned architect John Eberson, the Central National Bank Building is a steel-frame, limestone-clad skyscraper that serves as the only structure in Richmond, VA designed in the art-deco style of architecture. 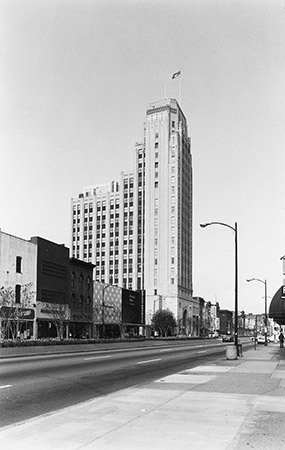 The iconic building was the tallest skyscraper in Richmond for over 40 years and was a symbol of prosperity. Whether you visited this bank as a customer or with your grandparents, all Richmond natives are familiar with this buildings prestigious look. Once called the Central Fidelity Bank building and used last as a Wachovia bank branch it is now listed on the National Register of Historic Places. In 2005 Douglas Development bought the 219 E. Broad Street building and held on to it through the real estate recession before beginning the redevelopment process. Ideas on how to revitalize and repurpose the structure floated around for many years, but nothing congealed until 2013 when it was decided to transform this monument into an upscale modern functional apartment community, within a historically preserved building, as part of the revitalization of downtown Richmond’s Arts & Cultural District. The buildings unique culture mixed with the lavish upgrades provide a decadent and modern lifestyle in a class all its own.